There’s a reason the media has dubbed matchmaker Rachel Greenwald as “The Wife Maker.” Yes, she’s responsible for over 820 marriages, but more importantly, she has solved perhaps the biggest dating mystery of all time: when you finally meet Mr. Right (or even Mr. Potential), what really compels him to call back (or not) after a date? Armed with her Harvard MBA, Rachel embarked on a fascinating 10-year research project to decipher this puzzle. 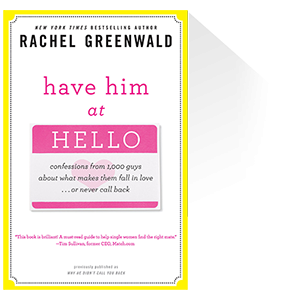 In Have Him at Hello, she applies her business savvy to the dating world by conducting in-depth “exit interviews” with 1,000 single men, asking why they called back one woman, but not another. By refusing to accept the post-date brush-off like “There wasn’t any chemistry…” or the positive, but equally vague evening recap, “We hit it off!” Rachel extracted unabashedly honest and raw details why one date failed while another succeeded. It turns out there are clear, tangible, consistent reasons why marriage-minded men either fall for you or disappear. The surprising “Top 5 Date Makers” and “Top 10 Date Breakers” revealed in this book (for women of ALL ages!) can actually change your fate when Mr. Right finally comes along. Rachel’s goal isn’t for you to pretend to be someone you’re not, but rather to keep the ball in your court. By using her innovative research and tips as a guide, more men will ask to see you again; then you can do the selecting, rather than wondering if they’ll call. Because information is power, this book will make your first hello a lasting one. Surprisingly, 90% of the time women guessed incorrectly the real reasons why a budding relationship either developed or dead-ended. Citing hundreds of true anecdotes and case studies, this book examines the most frequent date-makers and date-breakers revealed by men, with practical advice on what to do about the issues. In today’s increasingly complex dating world, both online and offline, learning how to maximize your first impressions (by email, text, phone, and in-person) is essential. With a fresh and entertaining behind-the-scenes vantage point, Have Him At Hello offers simple solutions that empower women to choose the men they really want to date.